Confronting the Challenge of Reproductive Health in Africa is an indispensable resource for anyone delving into the field of sexual and reproductive health and rights, either as a student, practitioner or policymaker. 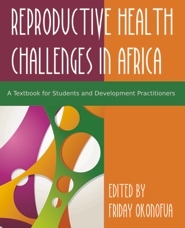 The compilation of chapters provides contemporary and detailed information about the context, principles and practice of reproductive health in Africa from multidisciplinary and multi-sectorial perspectives, as well as evidence for designing cost-effective interventions. Written in a simple free flowing prose by experienced international scholars, and organized in an orderly manner, the book will fill an important gap in health promotion for development in Africa. Friday Okonofua (MD, PhD, ad eundem FRCOG, FWACS, FMCOG, FAS) is a professor of obstetrics and gynaecology at the University of Benin in Nigeria and a Fellow of the Nigerian Academy of Science. He has served variously as Secretary General, Society of Gynecology and Obstetrics of Nigeria (SOGON), Secretary of the Faculty of Obstetrics and Gynaecology of the National Postgraduate Medical College of Nigeria, Executive Director of the International Federation of Gynecology and Obstetrics (FIGO) and as Honorary Adviser on Health to President Olusegun Obasanjo of Nigeria. Professor Okonofua is a global champion of women's health, a discipline where he has published more than 240 journal articles and obtained up to 50 international research grants. He is the founder of the Women's Health and Action Research Centre, one of Nigeria's leading NGOs, and the founding editor of the African Journal of Reproductive Health. He is a member of the editorial board of the British Journal of Obstetrics and Gynecology, and several international journals and non-profit organizations. He has served as consultant to the World Health Organization and as program officer to the Ford Foundation.